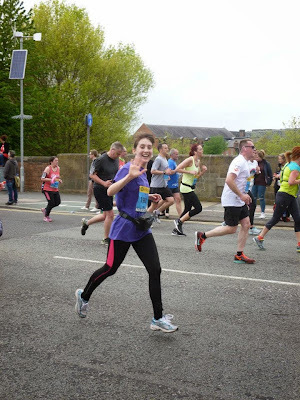 So I'm very achy and a teeny bit worried about my (new) old knee injury but we came and we conquered the Manchester 10K run on Sunday and it was fantastic. Sally and Pete aceing it- TICK!! I tentatively started running again in January, taking it really, really slowly. When I had the opportunity to run the 10K I was slightly nervous about signing up, as it seems that every time I sign up for a run I get injured, Not this time though, and I was thrilled! Here's a pic my sister took of me about 500m from the end. Nice shot sis, my feet are not even on the floor! Wooh... well done you! You look like you are flying in the pic! I'm planning on getting out and a bit fitter over the summer, but to being a bit decrepit/middle aged I am going to be walking rather than running!